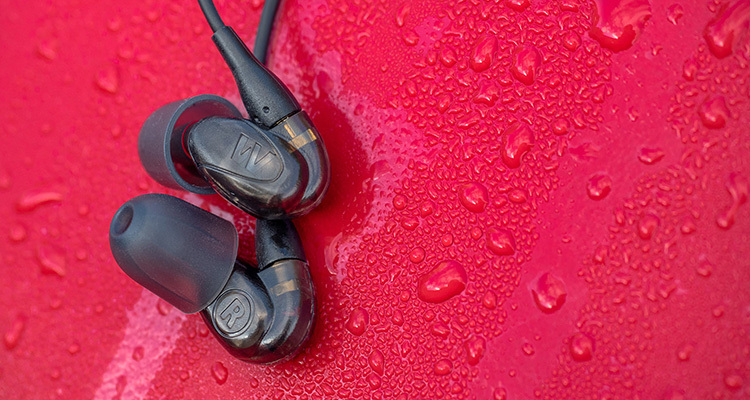 At $99 US dollars, the UM1 is Westone’s entry-level, universal in-ear monitors. They are suited for professionals and consumers alike. If I counted correctly, this is already the third version. The first UM1 had a transparent shell and a twirled cable, the second version was red and switched to a round cable. This version is grey and for the first time features a removable cable. Sadly Westone missed remarking the version somewhere so I will just refer to them as “the new UM1.” To my dismay, I am not familiar with the previous versions of the UM1 so I can only review them for what they are and not highlight any differences. Packaging is very straight-forward. You get a cardboard box with a plastic window and a whole bunch of product information printed on the sides. Grey and orange are the theme colors and they imply maturity and warmth. I can confirm the packing theme fits the product. Westone includes the IEMs, plenty of ear tips, a cleaning tool and a ridiculous pouch in the box. Seriously, the pouch is the cheapest you can find on Chinese sales platforms and it downgrades the whole experience. It is almost too small to fit in the IEMs with cable unless you like to cramp them in, in which case a cable break will be inevitable in the long run. Surely a company like Westone would have more experience than that. I suggest to just put the UM1 in your jeans pocket and put your keys into the pouch instead. 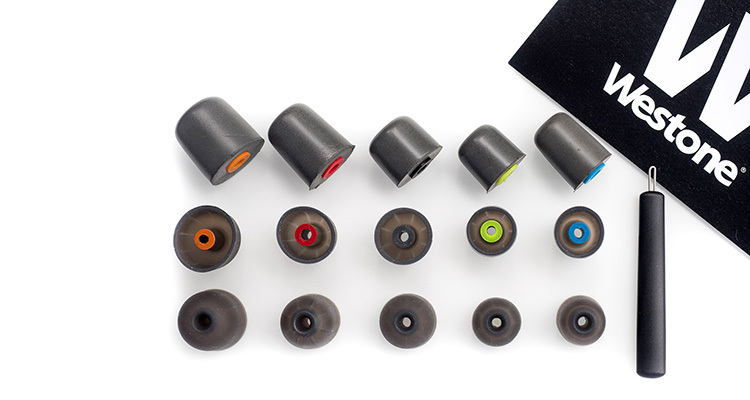 Westone provides a large selection of ear tips to help with a comfortable fit. There are five different sizes and all of them come as both silicone and foam versions. The sizes are color-coded and I sorted them for you in the picture. Interestingly, the sizes S and M also come in two different lengths. When using a longer stem, I suggest going with silicone instead of foam. The inner plastic ring doesn’t go all the way and it is very likely that the foam will be squished at the top end completely muffling the output. It’s a bit of a shame because the foamies feel very comfortable and are more durable than the expensive alternatives by Comply. I did have the foam rip off from the plastic ring when trying to remove the tip in the past, so I suggest to either place the IEMs in the freezer before pulling the foam off or to be very careful when replacing them. Try to grab the plastic ring at the bottom and you should be fine. There is no extravagance going on here. Just two semi-translucent pieces of plastic glued together. The outer side has an embossed Westone logo. The inner side does the same with the side indicator (either L or R). You can see the driver from the outside, though the product number has been removed. The driver is supposed to be proprietary to Westone, btw. I like that you can see the golden connections on the inside. I can’t find any production issues and the plastic seems to be very durable. I do hope that the long nozzle won’t break off but only time can tell. Westone set the industry standard for CIEM cables back in the day. For long have they relied on the 2-pin standard with twirled wires from Plastics1. Meanwhile, the market has become more diverse and also Westone moved on to MMCX connectors – which I personally don’t consider an upgrade. 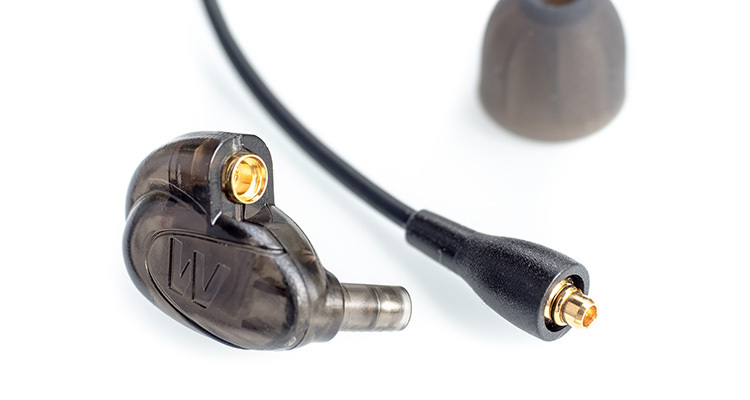 This time around, the new UM1 feature a replaceable cable for the first time and use Westone’s new connection standard. The cable is not twirled like the higher priced solutions or the first UM1 version, but instead is a simple, rubbery, more consumer-market oriented cable. It feels okay, but the memory is stronger and it won’t straighten itself even after a long while. It does feel more flexible than Shure’s cables, for example. You probably can’t tell from the pictures alone, but the new UM1 are tiny. The housing is very small and they hide well in your outer ear. The cable is worn above the ear but this time around the cable doesn’t have memory wires so it more or less just loosely tumbles around your ear. A secure fit is thus most dependent on the correct size of ear tips. But once that is figured out, I don’t know why these should not withstand even the wildest air guitar sessions. I also find them very comfortable to wear in bed and even sleeping on the side is not an issue. The new UM1 have a warm tuning that is easy to get into and feature a smooth and relaxed treble. Overall, there is no range in the frequency response that especially stands out. The UM1 has great potential for monitoring and are not grandstanding which makes them sound very mature and make them a good choice for fatigue-free long-listening sessions. Luckily, the warm coloration is done in a manner that is very homogeneous and later I will even provide a trick on how to adjust the UM1’s tuning to near reference linearity. 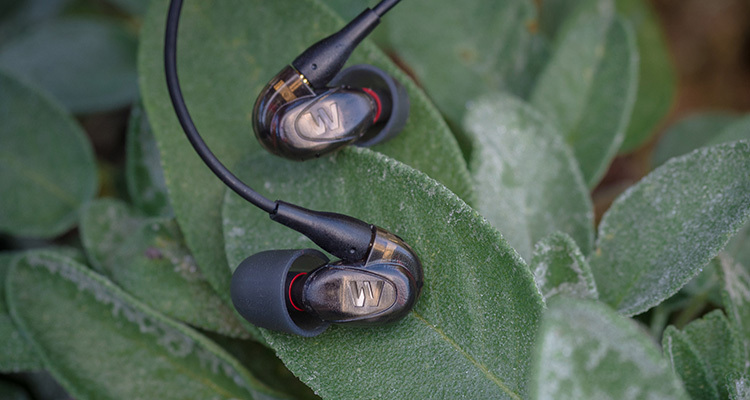 The UM1’s bass has a boost in the upper range that gives the bass good body, but mostly warmth and some punch. The bass texture is very detailed and works especially well with bass strings of all kinds – acoustic or electrified. Subjectively, the bass rolls off below 100 Hz but there is still some sub-bass information left that will gain a presence at louder volumes. However, the Westone UM1 might not be the best choice for Dance music or bass heads that need the rumble. Instead, it does very well with kick drums. The midrange can come across as a bit clouded, veiled or even dull. This is due to a warm tilt that emphasizes on warmth and fullness. The upper midrange is shy of 5 to 8 dB which sounds very relaxed as it broadly avoids sharpness, edge and even crunch. However, the warm tilt is very consequent, making it easy for the brain to adjust, so I can’t say that it works better for male or female vocals. It is a coloration that can easily be compensated and among the warmth, there are no apparent peaks that add further distortion to timbre. Vocals stand freely and well-contrasted. As already mentioned, the lower treble has a relaxed and broad dip. While not fully balancing the warmth, treble details are uncovered through harmonics in the range of 8 to 10 kHz. There is still plenty of headroom to avoid any sibilance, but it gives cymbals a nice shimmer even though they are recessed overall. The treble extension is okay for a single BA receiver, though you should not expect airy details above 12 kHz. The sound reproduced by the new Westone UM1 can come off as a bit flat, veiled and dull. This is an effect that is more apparent at lower listening volume than higher volumes. But apart from the tuning, the speed and decay are very good for an entry-level monitor. My guess is that Westone favors musicians that like to turn the volume up. In this case, the Westone perform very well and the bass remains tight while cymbals aren’t slacking. Did I mention the UM1 work well for Rock music yet? No, but I should have. I’m not going to name soundstage as one of Westone UM1’s strengths. This is not a monitor that spans a big room with instruments floating in a sphere around you. The UM1 deliver what they got to your doorstep; all up front and direct. Layering is precise but shallow in depth. In the end, it’s an in-ear monitor and if you expect out-of-ear-locality, though some IEMs manage to do that, this is not the one for you. That does not make them any less useful for monitoring, though. No doubt there will be users who more than enjoy the default tuning. It is inoffensive and hides errors on the recording. In terms of high-fidelity, I want a more linear frequency response. Luckily, the UM1 has a smooth response already, that makes them very compatible with even the simplest of equalizers. Increase the impedance. With higher output impedance the UM1 lose some warmth. The effects are subtle so I suggest you grab at least a 75 ohms resistor cable adapter. This helps to open up the sound quite a bit and the Westone no longer sound as muffled. Male voices still have a tendency to sound honky and female voices can sound slightly hollow, but I think it’s already an improvement overall. The bass is also pushed more to the low-end. As these are very efficient earphones, they will still reach very high volumes from any source. Replace the filters. If you look inside the nozzle, you will find filters with a brown-orange ring at the end of the tube. These filters have a big influence on the sound and this version dampens the treble quite a bit. Luckily, these adhere to the industry’s standard and you should be able to find fitting replacements. If you need some help, head to the comment section below. Combine both suggestions for a sound signature that is close to Etymotic’s reference target but with a little sharper treble. At this price point still a very impressive feat. The UM1 are relatively stable concerning the source’s output impedance. You would have to use a portable device with a high impedance to easily tell a difference. But as already mentioned, a higher impedance would not have a negative effect unless you go to the headphone jack of your speaker amp, which often has 120 ohms, which would heavily distort the IEM’s frequency response. Also, the UM1 is very sensitive and reach high volumes very quickly. I hover around the first three steps on the iPhone. Even with the iEMatch on ultra setting, I wouldn’t be able to reach the top volume levels. 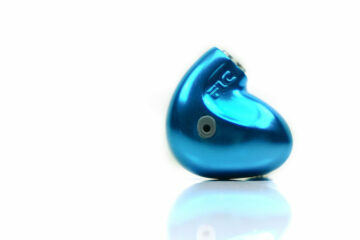 So if you like to listen to your music loud, here’s an IEM for you! Hiss is not easily picked up and I could use the UM1 with the Nintendo Switch without problems. So that’s good news for compatibility. Even though the UM1 are very sensitive, they manage to remain stable and keep their original signature. That makes it difficult to recommend special synergy pairings. So my advice is to just use the headphone jack on your smartphone (if it still has one) and not worry too much about the audio chain. 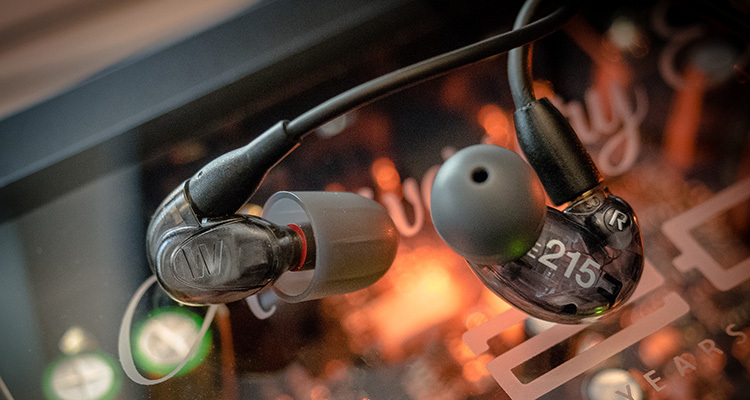 The Shure SE215 has long been a default recommendation for IEMs up to $ 99. Westone has long competed with the UM1 but until now they have not managed to take the spot. Let’s see how the latest version fares against the reference. Both have a replaceable cable with MMCX connectors. Shure’s cable is very stiff and from experience, I know that it wears out fast. Westone usually has better cables but since the UM1 has its own version, only time can say how durable it is. For now, it feels more flexible. The shell design is also similar, but the UM1 is much smaller. I must say that the Shure feels snugger due to the bigger body, but in the end, I am fine with both. So differences mostly boil down to the sound. The bass on the SE215 is very boomy and allows less texture detail. However, it also provides much more punch, extends deeper and is more suitable for EDM and Hip-Hop music. I feel like the UM1 is faster but I am not sure if it’s because of the tuning or not. Neither SE215 nor UM1 has noticeably recessed mids, but the UM1 do a better job at placing them upfront. Whereas the UM1 make the midrange sound thick and veiled, the SE215 tend to sound hollow and shrill. Neither IEM impresses with treble accuracy and both have a similarly recessed tuning. Due to the heavy bass, the treble does get easier lost with the SE215. Overall, I prefer the new UM1 over the SE215; I just wish Westone had included the same carrying case as Shure. So where do you get those replacement filters?